If you head north on Interstate 95 and exit on Oakland Park Blvd heading east, do not be surprised if the wind and rains suddenly begin to fall. This inexplicable change in the weather might be because you have entered Mills Pond Park, otherwise known as the eye of the Hurricanes. 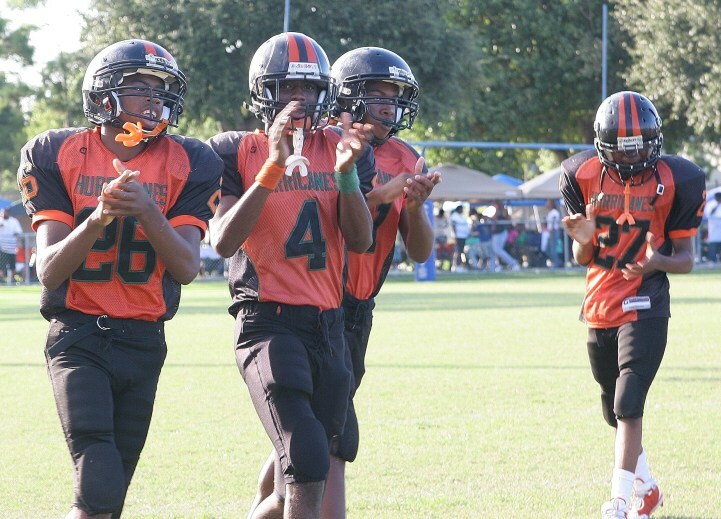 The Ft. Lauderdale Hurricane Optimist program proved its worth last year bringing home a total of four super bowl championships in the South Florida Youth Football League (SFYFL). The Hurricanes earned titles at the Team 56, 110 lb, 135 lb and 165 lb weight classes. This year, the park looks to take home even more championship trophies. Coach Antwan Armalin has been the 110 pound Hurricanes’ coach for the last five years. Last year, his team was one of the most dominant in South Florida youth football across the four major competitive leagues. Boasting superior talent from the likes of running backs like Roderick Allen and other skill position players like Johnny Floyd and Johnny Johnson, Armalin’s team did not drop one contest all season. During the offseason, Allen and some of his other running mates from last year’s team have moved up to play on the 135 pound level. Thus, Coach Antwan and assistant coach Nikia Johnson (Coach Meat) and the rest of the 110 pound staff, have to reload. And they have done exactly that. 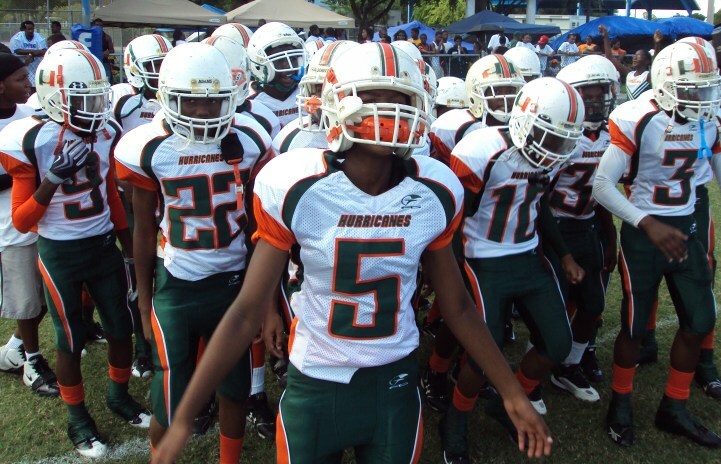 This year’s team is comprised of a lot of the youth who played on the 2009 Hurricanes 100 pound super bowl runner up. Those players are joined by several players from the winning 100 pound team at the nearby Lauderhill Lions program. Combined, the two forces should immediately make the Hurricanes the favorite to repeat as champions. “Everybody wants to play for a winner, kids want to win and they want to look good doing it,” Armalin says. And because his teams are always well organized from parent participation to coaching investment (each coach is required to contribute significantly financially), he attracts talented kids year in and year out. The Hurricanes 110s will again be sporting new uniforms this year. Since 2004 when Coach Antwan began coaching on the 110 pound level, he’s always been in the South Florida Youth Football League championship game. His team has a staff that has dedicated themselves to being professional on and off the field and teaching the fundamentals to their kids which garner results on the field. But above all, they stress academic achievement. “I instill the same principals my father instilled in me, student-athlete and not the other way around.” “You can’t play for me if you don’t have the grades,” Armalin says. Coach Antwan’s football background aides his ability to consistently produce talent at this level. He played college ball at Victor Valley College in Southern California. When asked why he chose not move up to the 120 pound level with the super star team he fielded last year (widely considered one of the top five teams in the entire region) Coach Antwan’s reply was definitive: “We don’t follow kids.” “If we [follow kids] they will not have the opportunity to learn new things from different coaching staffs.” “Here at the Hurricanes, coaches do not go from pound to pound.” The secret, he says is that the entire Ft. Lauderdale Hurricane organization has talented coaches. “We don’t have to build at team,” he says. This allows kids to start out as pee wees and come up through the system to become dominant at every weight class. As for his challenges with this year’s team, Coach Antwan says he’ll have to do more coaching this year with his new kids and he’ll have to preach family. He wants his players to become unified and play together as a true team. For the past two seasons, the Hurricanes 90 pound team has fallen just short of reaching its ultimate goal of bringing home a championship. This year, with the help of park president Brandon Bivins, the 90s want to push through and win a title. With the two time defending super bowl champions at Pompano Beach Cowboys setting the mark, Coach Roach and his staff know that they must come out hard in what should be a loaded division with talent in both the north and south divisions. In a brief sit down with Coach Bivins, he identified a few stand out players to keep an eye on this season. Quarterback Trevis Robinson, fullback Corey Prince and running back Tiawan “Speedy” Mullen. Mullen is a player that came over to the Hurricanes from the neighboring Lauderhill Broncos program. During practice, Speedy stood out the most. His ability to quickly cut up field and get through the gaps will make him a key component of this team’s offense. And the nickname Speedy is well earned. He’s easily the fastest player on the team. Returning as the super bowl champs is a privilege but it carries a heavy burden for Coach Jamal and his 135 pound Hurricanes. He’ll have a mostly new group of kids but gains a lot of talent from lower pounds who are moving up to play. Most notably Roderick Allen from the 110 pound champions last season. He’ll have to replace the stellar quarterback, Zack Hill, who is rumored to be playing for American Heritage High School this fall. During practice, the coaches were working the offense primarily and then begin to turn up the heat with an integrated scrimmage between the 160 pound team and Coach Jamal’s squad. Early indicators are that this team will be around to contend for the championship with the talent from the south division coming from Miami Gardens’ Vikings and Ravens teams. This entry was posted in Broward, Youth Football and tagged Fort Lauderdale Hurricanes, sports, youth football. Bookmark the permalink.